The EasyGrout System is the only multi-purpose battery operated grouting machine available – convenient for on-site portability and scaffolding. Designed for industrial, commercial and architectural applications, EasyGrout is lightweight, compact and easy to operate. EasyGrout is approved for historic preservation and suitable for filling grout facades of brick, stone or rock. 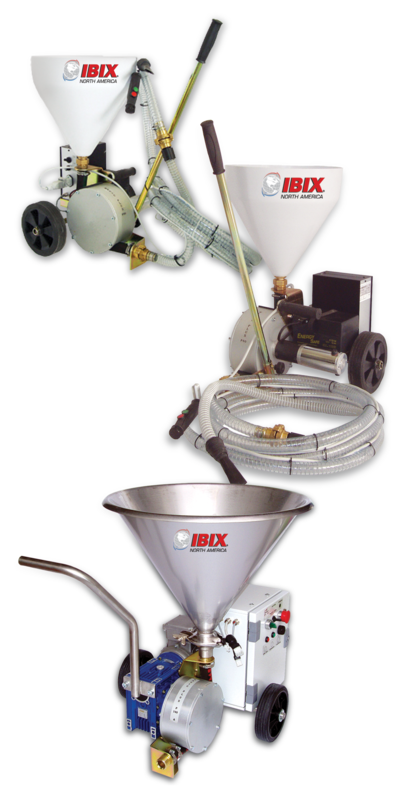 IBIX offers three nozzles for different applications; one for injection, one for micro-injection and one for pumping and spraying. EasyGrout is suitable for using cement compounds, premixed or custom mortars, epoxy, glues, resins, polyurethane and more. Testing by an independent reputable US restoration firm prove our equipment speeds up the grouting process by 40% over traditional methods.